It is safe to say that after years of disappointment, investor expectations were low ahead of today's Deutsche Bank earnings report. Yet somehow, the biggest German lender failed to beat even the most pessimistic one. Deutsche Bank, which had already guided for a slump, shocked markets when revenue that missed the lowest estimate and fell to the lowest in seven years amid declines at businesses from transaction banking to equity derivatives, and pretty much everything else. Even cost control - supposedly a key feature of CEO John Cryan’s tenure - was worse than expected. The company also reported a €1.3 billion loss for Q4, which while better than the company's disastrous report last year, was €100mm worse than the lowest forecast and far worse than the consensus loss of €478mm. "The results are disappointing again and we don’t see anything encouraging in them, reinforcing our doubts in the bank’s strategy and management," said Michael Huenseler at Assenagon. "There’s no silver lining." In line with its US peers, revenues in the all important fixed income and currencies trading group fell 29% year-on-year, and combined FIC and FIC-related financing were 20% lower. Echoing JPM and Goldman, Deutsche said the division suffered from "low volatility, low institutional client activity and difficult trading conditions in certain areas", Deutsche said in a statement. Overall trading revenue at the investment bank, excluding financing, declined 27 percent, Deutsche Bank said. Meanwhile, Q4 result in Deutsche's investment banking division, which accounts for more than half of overall revenues, were also at the low end of analyst expectations: at €2.7bn, revenues were 16% lower than a year ago and 13 per cent below analyst expectations. The division reported a fourth-quarter loss before income taxes of €733m, more than two-thirds higher than a year ago. 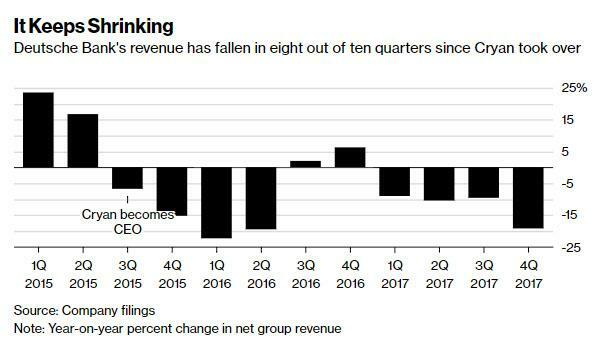 As Bloomberg notes, Deutsche Bank's revenue has fallen in 8 out of the 10 quarters since Cryan took over as CEO. To be fair, Deutsche did warn in early January that combined revenues in fixed income and equities trading and financing will be down by up to 22% - the five largest US investment banks reported an average drop of 19 per cent, according to data by Autonomous Research - but clearly the market was not prepared for it. Deutsche shares tumbled more than 5% as a result, the biggest drop in 6 months, and the lowest since September. Always keeping the faith, even as calls for his resignation have never been louder, Cryan again expressed the bank’s dissatisfaction with the results while holding out hope for a return to growth in 2018, saying that he expects higher returns with sustained discipline on costs and risks. "We have made progress, but we are not yet satisfied with our results”, said chief executive John Cryan. For the full year, Deutsche reported a net loss of €500m, the third annual loss in a row. It was triggered by a €1.4bn non-cash charge caused by the US tax reform, which dented the value of deferred tax assets in the US. Maybe there was a little silver lining: Cryan said that client activity picked up in January and he pointed to good economic growth in all major global markets. The bank is paying a one-off bonus to its corporate and investment bank as it seeks to strengthen the business, a move that is sure to stir the activist investors with demands for Cryan's scalp. Looking ahead, The lender also scrapped its 2018 target of lowering total adjusted costs to about €22bn this year and said total costs will be about €1bn higher, as business disposals that were supposed to reduce costs by €900m have been delayed or suspended. Meanwhile Cryan is running out of time to show he can lead Europe’s largest investment bank back to strength. The Brit has defended his strategy, saying two weeks ago that his turnaround plan had entered a “third phase” in which growth should finally be restored and on a conference call on Friday that client activity picked up in January. While it is unclear what if anything will help Deutsche Bank get out of its 3 year-long funk, it is increasingly obvious that one more quarter as bad as this one may be Cryan's last.